You read Pam Ondash’s story in our previous Giving Back Spotlight on MADD (Mothers Against Drunk Driving). Pam works closely with Natalie Parkinson, who has also dedicated her life to volunteering with MADD. Below Natalie explains how her daughter Renee’s life and legacy are carried on through her work with MADD. “My daughter, Renee, was an elementary school music teacher. She loved music and her students, and she used those loves to make her place in the world. We were proud parents and life was great in many ways. On July 4, 2007, everything changed. Renee was killed by a first-time DUI offender just north of the Wexford exit on I-79 as she was driving home from watching the fireworks. The offender was drunk, speeding, and was also using his cell phone. He thought he was on his way home but had ended up driving 50 miles in the wrong direction from his house. My journey volunteering with MADD began that same month. 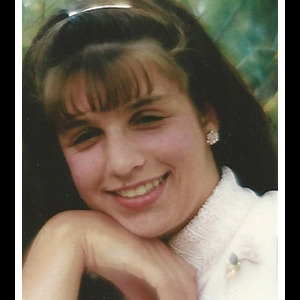 I was living in northern Virginia at the time, and from the moment the Virginia sheriffs relayed the message that Renee was left on the road to die from the 101 mph impact, we all realized our lives were going to be different. But none of us yet knew how steep the learning curve would be. The MADD volunteer for Northern Virginia contacted us and offered support. By coincidence, Renee and her son shared the same obituary page in the paper. He died many years after being a victim of a DUI crash as a child passenger. We connected on an emotional level, and I made a few attempts to be involved with MADD in those early months of grief. Virginia was the first place where I was part of MADD law enforcement support at a roadside sobriety checkpoint. It was a hot summer night as I stood on the median of that highway checkpoint location. I remember the heat from the asphalt radiating through my shoes and wondered how my Renee felt as she lay dying on the hot interstate that summer night. To this day, walking on warm asphalt continues to be a trigger for my emotional breakdowns." About the same time that summer, I was contacted by Traci Vandyke-Heilmann, the MADD victim services specialist for Western Pennsylvania. She advocated for us throughout our criminal process. We were thankful for the help, especially living five hours away from Pittsburgh. MADD’s assistance was lifesaving for us in navigating the legal system. There was no cost and they supported our entire family in whatever way we needed. If it was a late-night emotional breakdown, MADD was there. There were frequent calls to check on our well-being. We were not just their job. We were a broken family who needed help and we were their focus for however many years we needed them. We knew nothing of the legal language so many people were fluently and rapidly speaking around us. We knew nothing about the crime of DUIs. We had no idea what a complex system we had entered. We were emotionally frail and literally sick over how easily our lives could be torn apart at the hands of a selfish decision. Our youngest daughter, Lisa, had intense survivor’s remorse that continues to this day. Grief was nearly eating our family alive. I had decided to not let the offender take anything more from us. I have no idea where the strength came from to volunteer, and had no idea what I was in for, but I had to create a way for a positive legacy to come out of this trauma. As my volunteering with MADD evolved, I began speaking to DUI offenders enrolled in the ARD (Accelerated Rehabilitative Disposition) program at Victim Impact Panels. I explain my loss to those who are primarily DUI offenders but have not killed anyone. The hope is that they take our experiences and use them to make better decisions as they moved forward in life. To date, I have spoken to thousands of people over the years. My Impact Panel speaking has evolved into speaking to prisoners at State Correctional facilities. I have learned as much from some of these prisoners as they have learned from me. It has broadened my feelings on rehabilitation, and the complex question of crimes and penalties. It is difficult for me to realize that life in our country is not judged equally state to state, judge to judge, and even crime to crime. Sometimes I speak as a MADD volunteer, other times I come in just as an ordinary person, a regular mom trying to cry out for change. I also volunteer with Walk Like MADD, a huge annual undertaking. Pam Ondash and I have worked on the walk together for the last four years. Pam, this dear friend of mine, is a remarkably strong woman who I met at a Butler speaking event about five years ago. She was a new volunteer to the MADD family after the death of her son, David Cook, at the hands of a repeat DUI offender. We connected immediately on many levels, and became not only good friends, but advocates for each other as we shared similar circumstances. We live the complex dynamic of DUI fallout in our families’ daily lives and can support each other through both the bad times and the breakthrough good moments. Pam was asked if she would chair the first Walk Like MADD event in Pittsburgh, and I hesitantly volunteered to assist, having no idea what that “yes” meant. Neither of us knew what was involved, or how many man hours it would take. But we supported each other that first year and laughed at our innocence. Most importantly, we were determined to stop DUI and educate others. We have found along the way there are many victims out there who feel the way we do, and that has encouraged us. Pam and I hold mini support sessions/pot luck socials at her home for victims of DUI. Most of the time, we are a traveling duo, working together on the walk, making community connections, and volunteering as a package deal. We take training together and have experienced many humorous mishaps, all taken in stride for the cause of volunteering to help end DUI. I took a very early retirement from work a couple years after Renee’s death. Although I tried, it became emotionally too difficult for me to work and deal with grief at the same time. I am thankful for being able to step back, but sometimes I feel like I have failed at life because I feel weak. This tragedy has broken all of us. Maybe volunteering is my new work, my new job. My lot in life has dealt me a perspective and burden that many do not have to carry. They say you must adjust to the changing world. All I know for sure is that being a victim of violent crime is a terrible experience that no one wants or deserves, and it must stop. " Natalie is amazing. We knew from the moment we met her that we wanted to share her story if she would let us. She and Pam have taken horrific tragedies and found a way to use that pain to create change. We couldn’t think of a better two people to conclude our series on community heroes who inspire us. If you would like to learn more about MADD, the work the organization does, and how you can help, we encourage you to check out their website.